Our schoolhouse was built in 1870, but not at it's current location. 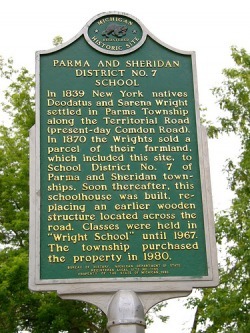 It was originally located near Albion, Michigan, and was used as a school there until the late 1960's. It was left vacant for many years (other than the animals that lived in it!) until it was offered to the Eaton Rapids Historical Society a few years ago. It was moved to its current location, and restored, which involved many volunteer hours and many dollars. The photo below shows how the school originally looked before it's move to Eaton Rapids. Photo by Joanne Canen, who attended this school at its original location!